This amazing fossil sold for $650,000. The good news is it will supposedly be displayed to the public, and not lost to some private collection, or relegated as a prop to some idiot creationist organization. I didn’t see any details on when or where it would be displayed, I sure as hell hope this doesn’t fall into the hands of AIG by some unknown quirk. Time will tell. See here for why it is a bad thing for AIG to aquire genuine fossil specimens: http://pandasthumb.org/archives/2013/10/creation-museum-1.html In other words an excellent specimen becomes lost to science, and the creationists use it as a prop to make absurd rationalizations, and even outright lies, about its origins. I understand that when something becomes available on the free market, it is fair game for whomever has the deepest pockets. It is just such a shame that a fossil that holds so much potential for future study, can be lost to shameless organizations that would make a mockery of it. I hope in this case it remains preserved with integrity. At this point the only information on where it went is to an “unnamed institution” Let’s hope for the best. 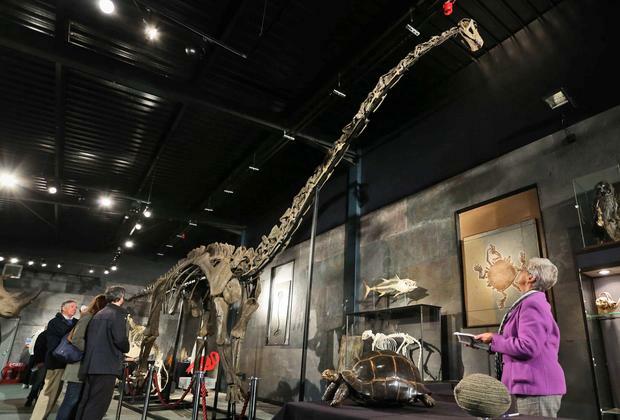 This entry was tagged Diplodocus Fossill Sells For 650 K, Dubious Intents, Fossil Auction, Fossil On The Free Market. Bookmark the permalink.